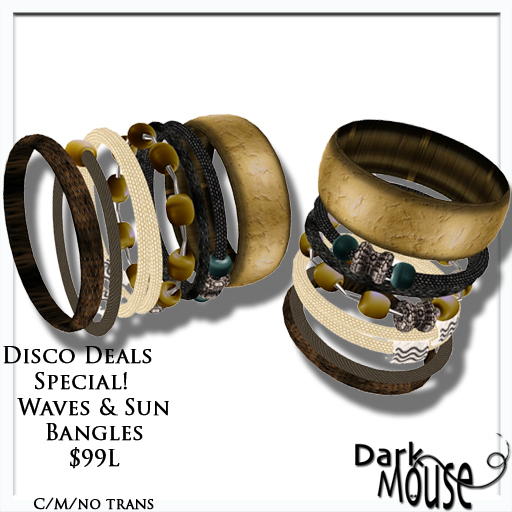 Dark Mouse does Disco Deals! Hi there, yep doing Disco Deals this month – along with a lot of other cool designers. 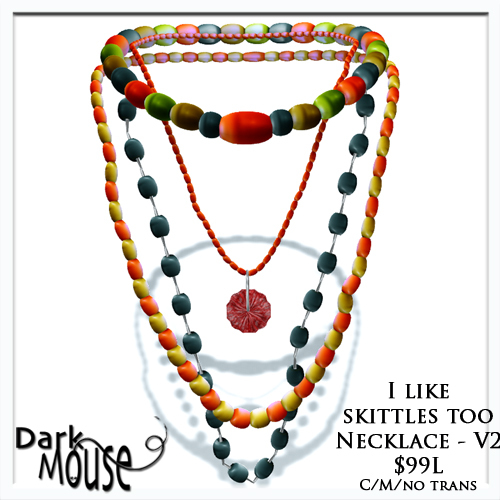 The other designers found at Disco Deals for the whole weekend are – Karizmatik Modern,Dark Mouse Jewelry, Miao, Somnia, Status, Sn@tch, Bother, Crackberry, Clutter, and C&D Designs – who’s stuff is not out yet, but will be out soon! 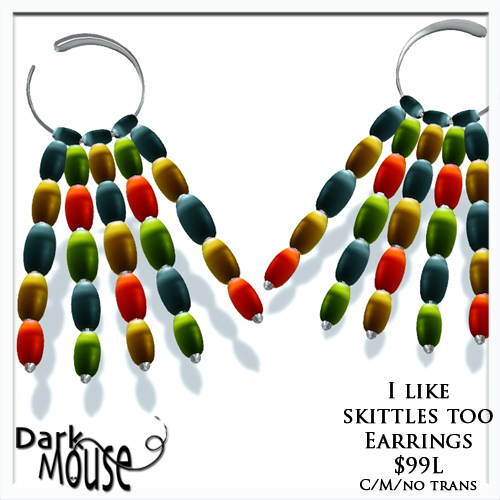 – So if you need jewelry to go with that hair, check it out! 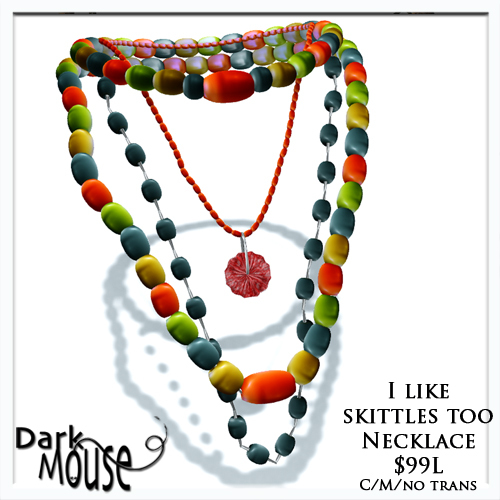 This new set is called, “I like skittles too” and is bright with lots of color for summer! There are bangles, earrings and two different versions of the necklace. Here’s a taxi to SCD’s Disco Deals!. 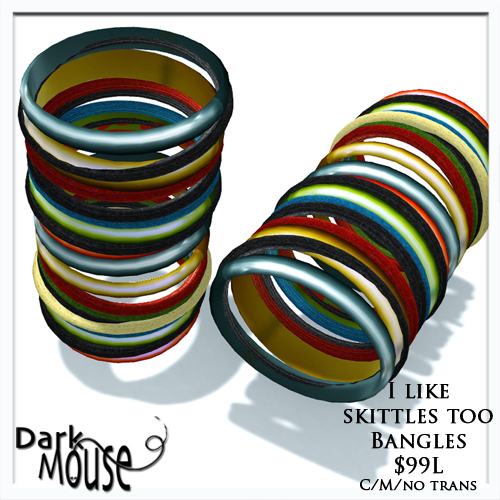 Hi there, I’ve wrapped up some loose ends, and will finally put out all colors of the specials I’ve had recently. The Belle Epoque set now comes in Gold, Silver and Copper – and has a lovely Victorian vibe to it! The Waves and Sun set is out for your beachy pleasure (hint, hint, looks great with a bikini!). And finally, A Daisy for you – in Gold, Silver and Copper. I love all these sets and hope you like them too. They can be found in the front of store in the new section! Here’s a teleport directly to them! Hi there, welcome to June! 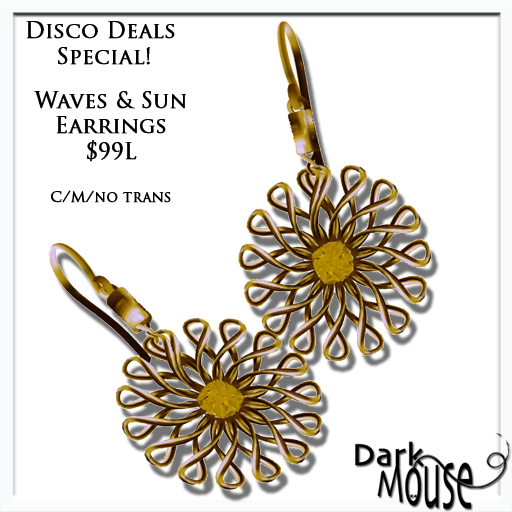 It’s Disco Deals time, and I’m releasing a new set, called, Waves & Sun, cause I was thinking of waves and sun and beaches when I was making it. 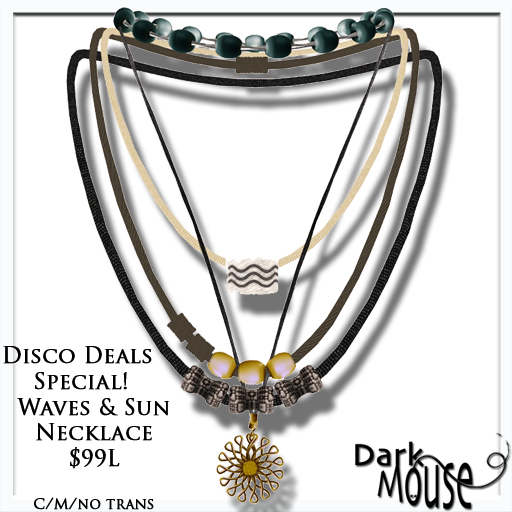 I hope you like it, you can get each piece for $99L at the Disco Deals bazaar this week! This new release is out NOW! Click this link to be taken directly to the Bazaar!